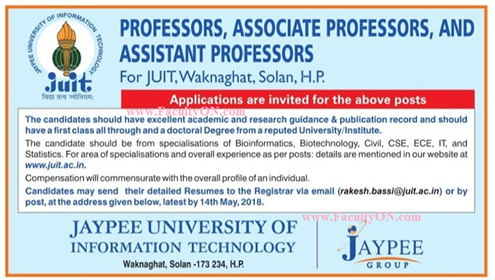 Jaypee University of Information Technology, Solan has advertised in TRIBUNE newspaper for the recruitment of Professor/Associate Professor/Assistant Professor job vacancies. Interested and eligible job aspirants are requested to apply with in 14th May 2018. Check out further more details below. About College: The University commenced academic activities from July 2002 with undergraduate B.Tech. degree programs in Electronics & Communication Engineering, Computer Science & Engineering, Information Technology, Bioinformatics, and Civil Engineering (from July 2003).